That said, I’m conscious that some of you may feel more comfortable going down this route and so I’ve done a bit of sleuthing around the internet, to share some resources below. Helping clients hone their vision. I would suggest reading the article and applying it to your circumstances. Do you think you will struggle to communicate your vision and if so, what can you do to work on that potential sticking point? Are you open to being challenged or do you want a designer who is going to follow your rules? Do you have time to invest in someone, to build a relationship with them? Do you have a budget in mind? All of this preparatory thought will help as you search for the right designer for you, so don’t be afraid to identify and seek out what you want. 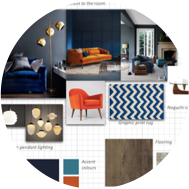 British Institute of Interior Design: A Client’s Guide to Working with an Interior Designer. One interesting note from this resource is that in the UK the term “interior designer” is not protected and so not subject to government regulation. That means any old (or young for that matter) Joe can call themselves an interior designer. I’m not sure if this is so in other countries, but best to check. Ultimately, this is a caution to do your research! The clever folks at MyDomain writing about some of their biggest pet peeves when designing with and on behalf of clients. Laurel & Wolf also offering their take on why it’s helpful for first time renovators to work with interior designers. If working one-on-one with a designer who comes to your home and who you consult with on a regular basis isn’t your thing this time around and you’re still feeling overwhelmed, perhaps consider “e-design” as this is a much less expensive alternative to getting a “professionally designed” room (or suite of rooms). Most designers will ask you about your vision (and will encourage you to create as many Pinterest boards as possible), your budget, and your priorities. They will then go away and do all the arduous work on your behalf, so you can sit back and leave the stress to someone else. At the end, you should be provided with a room layout, a list of furniture and a clear design for your space. As I haven’t worked with anyone in particular, I can’t make any recommendations at this time, but a simple search should bring up hundreds of options! Just remember you’ve got to feel confident in who you’re working with, as you’ve got to pay for it. If you have any experiences working with either interior designers or with an e-designer (positive or negative), please share as I would love to get your take on the process. Was it worth it? What were the pros and cons? Would you do it again? What would you do differently? All advice is helpful and welcome!